These wonderful waterbottles, with their easy to squeeze sides and spill proof valves come in three great colors to match your kits. 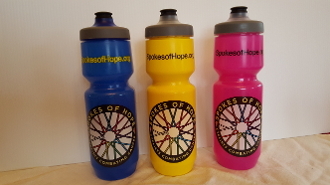 Classic Spokes of Hope Yellow and now Blue and Pink! FLEX: Thanks to ultra flexible walls, Hydroflo delivers a tidal wave of water. The secret is our next generation resin, engineered to be durable, super flexible and ultra clear. A fine-tuned design provides increased leak resistance and ensures the bottle stays in your cage, even on the toughest roads. FIT: Hydroflo’s unique, three-sided shape fits perfectly in your hand for a solid, controlled grip. The design reduces the chance you will drop your bottles through a perfect ergo hold. SAFE: Hydroflo is 100-percent recyclable, FDA approved, BPA free and indpendently tested and approved by SGS. PURE: To deliver a pure water taste, Hydroflo is infused with Purist. Using technology inspired by nature’s lotus leaf, Purist shields the bottle from odor, staining and mold buildup, so all you taste is pure water every time. No other bottle looks like Purist Hydroflo, or performs like it. It is the culmination of everything we’ve learned in over 30 years of making the world’s best water bottles. Try one: You’ll never think about your bottle again (for all the right reasons)!